Welcome to Mercy Ebute's Blog: Seek Justice not Retribution - American Lawyer writes Buhari on his Anti Graft War. 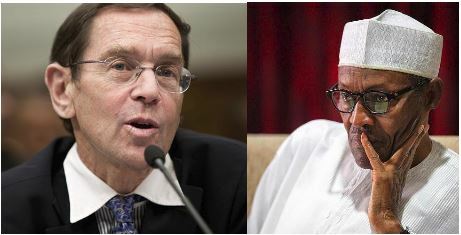 Seek Justice not Retribution - American Lawyer writes Buhari on his Anti Graft War. When you visited the United States Institute of Peace last July, you pledged that you would be “fair, just and scrupulously follow due process and the rule of law, as enshrined in [the Nigerian] constitution” in prosecuting corruption. But to be just, the law must be evenhanded. It cannot, in the manner of Russian President Vladimir Putin, be something that is given to punish your enemies and withheld to favor your friends. If so, the law becomes an instrument of injustice bearing earmarks of the wicked rather than the good. In the United States, you declared a policy of “zero tolerance” against corruption. You solicited weapons and other assistance from the United States government based on that avowal. But were you sincere? “On General Buhari, it is not in IBB’s tradition to take up issues with his colleague former President. But for the purpose of record, we are conversant with General Buhari’s so-called holier-than-thou attitude. He is a one-time Minister of Petroleum and we have good records of his tenure as minister. Secondly, he presided over the Petroleum Trust Fund, PTF, which records we also have. You then swiftly backed off your zero tolerance policy because you would have been its first casualty. You opportunistically announced that zero tolerance would be narrowed to the predecessor administration of Goodluck Jonathan because to probe further would be “a waste of time.” That conclusion seems preposterous. In 2012, the World Bank’s ex-vice president for Africa, Oby Ezekwesili, estimated that a stupendous $400 billion in Nigerian oil revenues had been stolen or misspent since independence in 1960. The lion’s share of that corruption spans far beyond the Jonathan administration. Your zero tolerance policy seems to come with a squint to avoid seeing culpability in your political friends. A few examples are but the tip of the iceberg. A Rivers State judicial commission of inquiry found that N53 billion disappeared from the Rivers State Reserve Fund under former governor Rotimi Amaechi. Former Lagos governor and head of your campaign finance team Babatunde Fashola was accused of squandering N78 million of government money to upgrade his personal website. The EFCC has ignored these corruption allegations, and you have given both promotions: the Ministry of Transport to Mr. Amaechi, and the Ministry of Power, Works, and Housing to Mr. Fashola. In contrast, you have played judge, jury, and prosecutor in the newspapers to convict former PDP Petroleum Minister Diezani Alison-Madueke of corruption. To investigate or prosecute based on political affiliation or opinion also violates Articles 2 and 7 of the Universal Declaration of Human Rights. It is unworthy of a great nation like Nigeria. Make the hallmark of your administration justice, not retribution, and you may live for the ages. I am a United States citizen and lawyer. I have no political standing in Nigeria. Some might argue that my speaking about the administration of justice in Nigeria bespeaks impertinence. But you chose to visit the United States to solicit weapons and other assistance from my government–a government of the people, by the people, for the people. The United States government represents me. What the United States government does reflects on me. I thus have an interest in addressing the actions of foreign governments that receive United States government aid. Sunshine is said to be the best of disinfectants.